When Sister Catherine was favored with these apparitions of the Blessed Virgin she related by word of mouth to her Director, what she had seen and heard, and he, though apparently attaching little importance to her communications, carefully took note of them. The Sister never thought of writing them, she judged herself incapable of doing so, and, moreover, in her opinion, it would have been contrary to humility. In 1856, when events had confirmed the truth of her predictions, M. Aladel told her to commit to writing all she could recollect of the supernatural visitations of 1830. She obeyed, despite her repugnance, and sketched an account of her vision of St. Vincent’s heart, which we have already read, and that of the apparitions of the Blessed Virgin. In obedience, she again wrote in 1876, an account of these same apparitions. Finally, another copy, not dated, was found among her papers after death. These three narrations accord perfectly in the main, yet differ sufficiently in detail to prove that one was not copied from the other. To these manuscripts, in which no change has been made, except a correction of faults in style and orthography, are we indebted for the following account of the apparitions. It is to be regretted that M. Aladel’s notes should have been almost entirely destroyed; no doubt they contained very interesting details, but what portion of them remains, is of little importance. Before quoting Sister Catherine’s own narration, we must remark, that the first vision, having little reference to anything but the Sister herself and St. Vincent’s two Communities, M. Aladel did not deem it advisable to have published; also, that although the account of the vision of the medal in the first editions of the notice, seems to differ notably from that related by the Sister, we will see later how these discrepancies can be explained, and that in the main the two versions are identical. To Sister Catherine Labouré, Daughter of Charity. After a picture painted from instructions given by Sister Catherine. Sister Catherine, already favored with celestial visions, ardently desired, with all the simplicity of her nature, to see the Blessed Virgin. To obtain this grace, she invoked her good Angel, St. Vincent, and the Blessed Virgin herself. On the 18th of July, 1830, eve of the Feast of St. Vincent de Paul, the Directress of the Seminary gave an instruction on devotion to the Saints and the Blessed Virgin; this but inflamed our Sister’s pious desire. Fully imbued with the thought, she retired for the night, recommending herself to her blessed Father, St. Vincent, and confidently believing that her prayers would be answered. The child conducts her into the sanctuary; here she kneels, whilst her celestial guide remains standing a little behind at her left. The moments of waiting seem long to Sister Catherine; at last, about midnight, the child says to her: “Behold the Blessed Virgin, behold her!” At that instant, she distinctly hears on the right hand side of the chapel, a slight noise, like the rustling of a silk robe; a most beautiful lady enters the sanctuary, and takes her seat in the place ordinarily occupied by the Director of the Community, on the left side of the sanctuary. 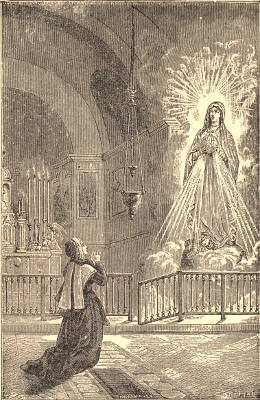 The seat, the attitude, the costume (a white robe of a golden tinge and a blue veil), strongly resemble the representation of St. Anne in the picture adorning the sanctuary. Yet it is not the same countenance, and Sister Catherine is struggling interiorly against doubt. Can this indeed be the Blessed Virgin? she asks herself. Suddenly, the little child, assuming the voice of a man, speaks aloud, and in severe words asks her if the Queen of Heaven may not appear to a poor mortal under whatever form she pleases. Her doubts all vanish, and following only the impulses of her heart, the Sister throws herself at the Blessed Virgin’s feet, familiarly placing her hands upon the Blessed Virgin’s knees, like a child beside its mother. “I then asked the Blessed Virgin for an explanation of what she had already shown me. She answered: ‘My child, the times are very disastrous, great trials are about to come upon France, the throne will be overturned, the entire world will be in confusion by reason of miseries of every kind.’ (The Blessed Virgin looked very sad in saying this.) ‘But come to the foot of this altar, here graces will be shed upon all—upon all who ask for them with confidence and fervor. “‘At a certain time the danger will be great indeed, it will seem as if all were lost, but do not fear, I shall be with you; you will acknowledge my visit, the protection of God and that of St. Vincent upon the two Communities. Have confidence, do not be discouraged, you are in my especial keeping. “‘There will be victims in other Communities.’ (Tears were in the Blessed Virgin’s eyes as she said this.) ‘Among the clergy of Paris there will be victims, Mgr. the Archbishop will die.’ (At these words her tears flowed anew.) ‘My child, the cross will be despised, it will be trampled under foot, our Lord’s side will be opened anew, the streets will flow with blood, the entire world will be in tribulation. '” (Here the Blessed Virgin could no longer speak, grief was depicted in her countenance.) At these words Sister Catherine thought, when will this take place? And an interior light distinctly indicated to her in forty years. “Will you and I see the accomplishment of all these things?” “If we do not, others will,” replied the simple daughter. On arising from her knees, Sister Catherine perceived the child just where she had left him, to throw herself at the Blessed Virgin’s feet. He said: “She has gone,” and, all resplendent with light as before, he stationed himself anew at her left hand, and conducted her back to the dormitory by the same paths as they had come. What has just been recounted was only a part of Sister Catherine’s mission, or rather a preparation for a future mission to be given her as a pledge of the Immaculate Mary’s tenderness for the human race. In the month of November of this same year, 1830, Sister Catherine communicates to M. Aladel a new vision; but it is no longer that of an afflicted Mother weeping over the evils menacing her children, or the martyrdom of her dearest friends. This vision recalls the rainbow appearing in a sky still black with storms, or the star shining through the tempest to inspire the mariner with confidence—it is the Virgin Queen, bearing the promise of benediction, salvation and peace. “At half-past five in the evening, whilst the Sisters were in the chapel taking their meditation, the Blessed Virgin appeared to a young Sister as if in an oval picture; she was standing on a globe, only one-half of which was visible; she was clothed in a white robe and a mantle of shining blue, having her hands covered, as it were, with diamonds, whence emanated luminous rays falling upon the earth, but more abundantly upon one portion of it. 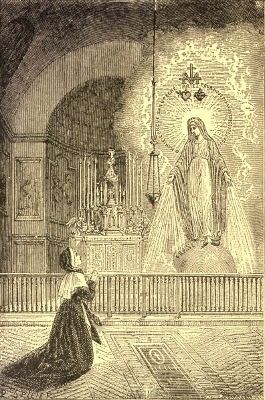 According to the testimony of Sister Catherine’s Director, this apparition appeared several times in the course of a few months, always in the chapel of the Mother House of the Daughters of Charity, either during Mass or some of the religious exercises. M. Aladel adds that he was not certain as to their number, but he knows they were repeated thrice, at least, the Sister having mentioned it three different times. “The 27th of November, 1830, which was a Saturday and eve of the first Sunday in Advent, whilst making my meditation in profound silence, at half-past five in the evening, I seemed to hear on the right hand side of the sanctuary something like the rustling of a silk dress, and, glancing in that direction, I perceived the Blessed Virgin standing near St. Joseph’s picture; her height was medium, and her countenance so beautiful that it would be impossible for me to describe it. She was standing, clothed in a robe the color of auroral light, the style that is usually called à la vierge—that is, high neck and plain sleeves. Her head was covered with a white veil, which descended on each side to her feet. Her hair was smooth on the forehead, and above was a coif ornamented with a little lace and fitting close to the head. Her face was only partially covered, and her feet rested upon a globe, or rather a hemisphere (at least, I saw but half a globe). Her hands were raised about as high as her waist, and she held in a graceful attitude another globe (a figure of the universe). Her eyes were lifted up to Heaven, and her countenance was radiant as she offered the globe to Our Lord. “Suddenly, her fingers were filled with rings and most beautiful precious stones; the rays gleaming forth and reflected on all sides, enveloped her in such dazzling light that I could see neither her feet nor her robe. The stones were of different sizes, and the rays emanating from them were more or less brilliant in proportion to the size. “I could not express what I felt, nor what I learned, in these few moments. “Suddenly,” says the Sister, “the picture seemed to turn,” and she saw the reverse, such as has already been described in the previous account of the investigation. Sister Catherine’s notes do not mention the twelve stars surrounding the monogram of Mary and the two hearts. Yet they are always represented on the medal. It is morally certain that she communicated this detail, by word of mouth, at the time she related the apparitions. Other notes in Sister Catherine’s own hand-writing complete the account. She adds, that some of these precious stones did not emit rays, and when she expressed her astonishment at this, she was told that they were a figure of the graces we neglect to ask of Mary. On a hasty perusal, our Sister’s account of the vision appears to differ from M. Aladel’s. We were struck with this, and had to study these interesting and authentic documents attentively, in order to decide whether the visions differed essentially or were really the same. According to M. Aladel’s testimony in the investigation, the apparitions relative to the medal were always similar, and Sister Catherine, before her death, confirmed this assertion. 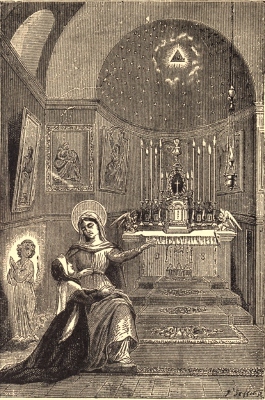 As we have just learned from our Sister’s own words, the Blessed Virgin always appeared with the terrestrial globe under her feet, and at the same time in her virginal hands, pressing it and warming it, as it were, against her maternal heart, and offering it to her Divine Son in her quality of Advocate and Mother, with an ineffable expression of supplication and love. This is what the Sister saw. Was it all? No, after the first act of sublime intercession, after this most efficacious prayer of our divine Mediatrix, her hands are suddenly filled with graces, under the figure of rings and precious stones, which emit such brilliant rays that all else is invisible, Mary is enveloped in them, and her hands are bent beneath the weight of these treasures. Her eyes are cast upon the humble Sister whose ravished glances can scarcely support this celestial effulgence. At the same time, an oval frame is formed around the vision, and a voice directs the Sister to have a medal struck according to the medal presented. The medal is a faithful reproduction of this picture, at the moment the symbolical part disappears in the sheaves of light. Sister Catherine being asked if she still saw the globe in the Blessed Virgin’s hands, when the luminous sheaves issued from them, answered no, there remained nothing but the rays of light; and that when the Blessed Virgin spoke of the globe, she meant that under her feet, there being no longer any question of the first. Hence, we may conclude, that Sister Catherine’s description of the apparition and M. Aladel’s agree perfectly. The small globe which the Blessed Virgin holds in her hands, and the large one on which she stands, are both inundated with the same dazzling rays, or enriched with the same graces. The august Mary seems to indicate by the small globe merely a figure of the world, imperfectly represented beneath her feet, thus reminding us that she is the all merciful Queen of the human race. There is yet another variation in the description of the two apparitions. M. Aladel, in conformity with the popular belief, that white and blue combined constitute the Blessed Virgin’s livery, as emblems of purity, celestial purity, gives the mantle an azure tint. Sister Catherine expresses the same idea several times in her notes, saying: “White signifies innocence, and blue is the livery of Mary.” However, the blue mantle is not mentioned in the notice of the apparition, Sister Catherine speaks only of the robe and veil of auroral light. When questioned as to a more definite description of this color, she replied that it was a deep white, tinted with the mild, beautiful radiance of dawn, thus wishing, no doubt, to give some idea of the celestial hue of the robe and veil. It is this hue that tortures the artist, for he feels his pencil powerless to depict the beauties of another sphere. We can understand from the above, how M. Aladel could have mistaken some details furnished by Sister Catherine, or have confounded the apparition of the medal with the visions of July 18th and 19th, in which the Blessed Virgin’s apparel was white and blue. However, the accessories of the mantle and its indescribable hue, in no wise affect the reality of the apparition. Every Catholic should have the Miraculous Medal in my opinion, along with a rosary. Greetings in Jesus, Mary, and Joseph. I seek images of the front and back of the “Miraculous Medal”, with the words in English, for the engraver to use as a model to engrave these two images onto the front of my burial monument. The oval engravings will be 4 X 6 inches. Please help.